Embedded System is a dedicated microprocessor control system, which development concept is that it can operate being embedded directly into the device, controlled by it. This means it is based on the embedded CPU module. 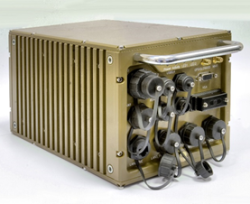 Such components include embedded panels and rugged PCs, covered in this article. Considering the fact that the embedded CPU modules are often designed for being installed inside a more complex device, during their development the following factors are important: low power consumption, compact size, as well as mechanical and climatic stress resistance. The CPU modules for industrial application are usually manufactured in the following standard form-factors: VME, VPX, CompactPCI, MicroTCA, AdvancedTCA, MicroPC, EPIC, EBX, PC/104, StackPC, COMExpress, ETX, SMARC, QSeven etc. A good example of such modules for industrial or transport application could be Single Board Computers (or simply SBCs) or Computer on Modules, which represent a turn-key solution, including all the required components that provide necessary operability. Minimum set of components includes CPU, RAM and chipset (set of system logic), supporting a certain minimum functionality, which usually involves serial ports (RS232, USB), standard extension buses, an interface for connecting disc subsystem (SATA) and at least one Ethernet port. An integrated disk subsystem, slot for memory cards (CompactFlash, SD or MicroSD etc. ), graphics subsystem, industrial interfaces (e.g. isolated CAN, RS422/485 and others), several Ethernet ports, availability of PCI-Express bus as well as analog and digital I/O can be considered as functionality extension. All the components are usually either soldered or onboard, but sometimes manufacturers offer using extension modules for RAM – SO-DIMM memory modules. Embedded industrial computers represent ready embedded high-performance solutions, designed to perform various tasks under complex conditions, due to their reliable structure and the lack of fans. The industrial computers enable building robust systems, which provide capabilities of flexible expansion and variation of functions. They are freely programmable and support not only general purpose operating systems (OS), but also real-time operating systems. This is why industrial computers are widely used in such branches as industrial production, healthcare, rail transport, marine, avionics, as well as in various mission-critical applications that require proper operation in harsh environments. The embedded computers can roughly be divided into two major categories: Panel PCs and Rugged Embedded Computers (hereinafter referred to as the Rugged Computers). A distinctive feature of Panel PCs is that they have visualization tools and I/O capabilities. In fact, a panel PC is a “full-blown” PC, which is only implemented as desktop. The Panel PCs most frequently have touchscreens and their front panels are only equipped with essential functional keys. The existing visualization and I/O tools make it possible to use Panel PCs for organizing Human-Machine Interface (HMI). Therefore they have the following application areas – terminals and operator’s consoles for control in the Automated Process Control System, transport means (cars, railway, ships, aircrafts), healthcare, sales and service industry. 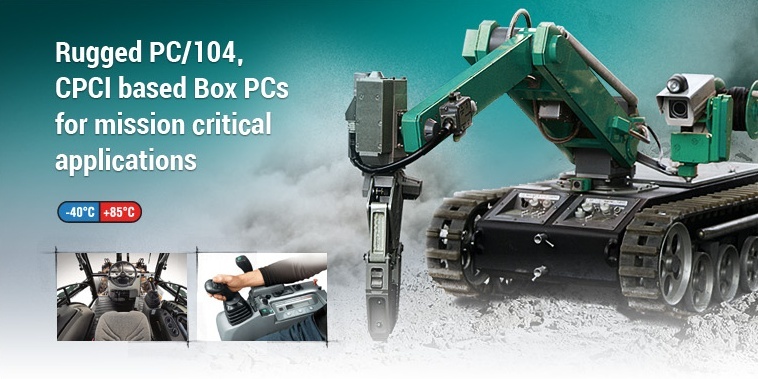 Depending on application conditions, the Panel PCs could have a rugged front panel, the entire rugged enclosure or could have no protection at all. A good example of an industrial PC is BS04. This computer is designed for transport and industrial use under conditions of adverse mechanical and electromagnetic effects in the wide range of ambient temperatures (–50…+60°C). BS04 is equipped with 10.4” display with resolution 800×600. The computer has a protection class of IP65 on the front panel and IP40 – for the rest enclosure. The device’s structure allows expanding functional capabilities using extension modules in mini PCIe format. BS04 ensures output of graphic and audio information, execution of control and diagnostics algorithms, processing information entered by an operator via keyboard. Rugged Embedded Computers, unlike Panel PCs, do not have integrated display and keyboard. These computers usually consist of a set of enclosed industrial modules, connected among each other in accordance with a particular standard. Connecting modules with each other is possible using two principles: bus-modular or stack principle. In order to build a bus-modular system, slot single-board computers are used, which are installed into chassis with a passive backplane. Examples of such systems are the most common systems in CompactPCI, VME, AdvancedTCA, MicroPC formats. Rugged implementation in such systems is achieved by the use of rugged chassis. With modules having conduction heat removal to the enclosure, it becomes unnecessary to use air filters and ventilation systems directly in the chassis and, as consequence, build excess pressure inside the chassis for dust protection – all that sufficiently reduces requirements to maintenance of such systems, enhancing their lifetime and reliability. Stack systems don’t use backplanes, and modules are connected to each other via stack connectors, where a backplane bus is routed. Stack systems primarily include the modules, corresponding to specifications PC/104, PC/104Plus, PCI104, PCI/104Express, StackPC, EPIC, EBX, 3,5". Stack systems are installed into enclosures with rather limited sizes, where a front panel is one of the sides, to which the necessary interface connectors are routed. A type of rugged computer organization based on PC/104 modules is exemplified by Fastwel embedded computers of МК series. For stack protection, a one-piece enclosure designed for a certain number of stack modules, is used. Heat removal is also carried out via side walls and output of all the required interfaces is arranged to the front panel. 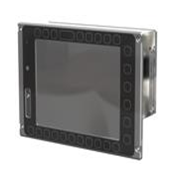 Such a structure ensures compact location of interface connectors and enables to install enclosure into a niche without an access to its back or side walls. Dust and/or moisture protection is ensured due to the use of the sealed interface connectors. One of the advantages of such rugged systems is their functional expandability. In this case, a stack can be used for installing any extension modules of the relevant form-factor, including special-purpose modules independently developed by the customer. The only thing which is required here is reprocessing a single enclosure detail – front panel, the rest stays without changes. For instance, MK306 Box PC (Fig. 2). This computer is designed for the use in the Automated Process Control Systems, in this case the necessary requirements to dust and moisture protection are ensured by external design solutions. MK306 can also be used as a part of laboratory equipment for development of software and system prototypes based on CPC306 CPU module. A key distinctive feature of Fastwel МК306 CPU module is its developed communication capabilities (2хEthernet 10/100, 2xRS232, 2xRS422/485) and availability of analog and digital I/O. 8 x isolated analog input channels, 2 x isolated analog output channels and 3x24 discrete input/output lines compatible with Fastwel UNIO965 modules are supported. MK306 has no forced cooling and contains no moving parts. MK307 (Fig.3) is a basic platform for developing computing and control systems operating under adverse environment conditions. The computer is designed for the use in mobile and transport systems. Access to connectors from the front panel and a cradle for fast and easy mounting makes it possible to integrate the computer into blind niches. MK307 is implemented on the basis of РС/104 and РС/104-Plus modules, with the enclosure having IP65 protection class. The design enables to install up to five extension modules. In order to output signals from the extension modules, the front panel is equipped with four 18-pin connectors. 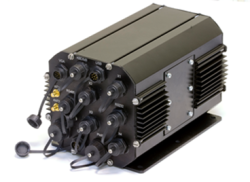 MK308 (Fig.4) is designed for the use in information management systems of special-purpose vehicles, including tracked vehicles. MK308 is based on the dual core Intel® Atom™ Processor D510, which performance is enough for solving complex computational and mapping tasks. Availability of VGA and LVDS interfaces makes it possible to use the PC together with a large number of rugged displays and show video information with a high detail level. In order to store mapping data, CompactFlash drive can be installed. Vehicle’s land navigation is ensured via GPS/GLONASS module. The computer is easily integrated into the onboard information management system due to the availability of two Gigabit Ethernet channels. RS-232/485/422 and CAN interfaces are used for controlling peripheral devices like equipment condition sensors and security devices. In order to connect РС-compatible peripherals, computer has three USB 2.0 ports, and for remote data exchange - GSM/GPRS and Wi-Fi modules. 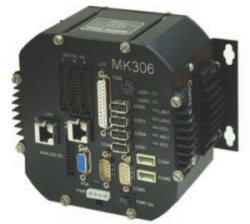 Modular design of MK308 supports installation of up to 7x PC/104+ extension modules. Enclosure has IP65 protection class. Fastwel MK300 PC platform (Fig. 5) is designed for the use in data acquisition and processing systems, operating in harsh environments. Modular structure of the device makes it possible to build the system for specific application areas, thereby optimizing the price/quality ratio. 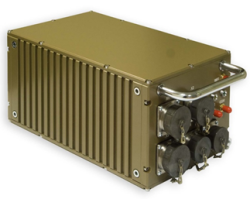 МК300 could be the basis for easily developed rugged platforms with the stack of PC/104, PC/104-Express and StackPC modules, either with conduction cooling or without it. Remove heat to the enclosure from any module. Install up to seven extension modules. Replace the factory pre-installed modules with those required. Change the number, type and location of connectors on the front panel. Route additional interfaces to a backup connector located on the front panel. The base version of MK300 has the following interfaces: VGA, 4xUSB, 1x GbE, 4x PoE GbE, 2x CAN, 2x RS422, GPS/GLONASS, WiFi. Due to its stable operation, MK300 can be used in all industrial applications. All devices of MK-series operate from the DC mains with the power supply voltage of 10...36 V, in the operating temperature range from –40 to +70°С. MKs are resistant to single shocks up to 100g and vibrations up to 5g.